eration and high top and cruising speed. fuel consumption and exhaust emis sion levels. operating range in combination with higher speed." Surveyed in December 2016 and all work fully carried out as raised in the Survey. Side deck Access door from lower helm position. Benefiting from a December 2016 Full Condition Survey, after which the owner carried out all the works highlighted as well as spending a considerable sum improving her throughout. She is now on the market as the owner is relocating to Australia. This Fairline Squadron 55 is an excellent example of Fairline's longest reigning model. Beautifully finished internally with stone leather and highly polished cherry woodwork. Spacious and luxurious with a 2 berth crew cabin with ensuite WC and basin. Her teak decks are in excellent condition and she has clearly been very well looked after. 6 Berths in 3 cabins, comprising of a double fwd and two twins port and stb with an infill cushion to convert into a double berth as and when required. 2 Heads with one ensuite. In addition to this there is a Crew cabin area with again an ensuite. She has a split level saloon with the upper having a dinning area to port and internal hem position Stb. The lower saloon has a large circular seating arrangement to Port and excess to the galley stb with cabinetry all finished all in a gloss cherry wood. She also has a fantastic utility room with washing machine and excess to the engine room. The exterior boasts and generously sized cockpit and bathing platform together with a full length fly bridge with plenty of seating and sunbathing areas. 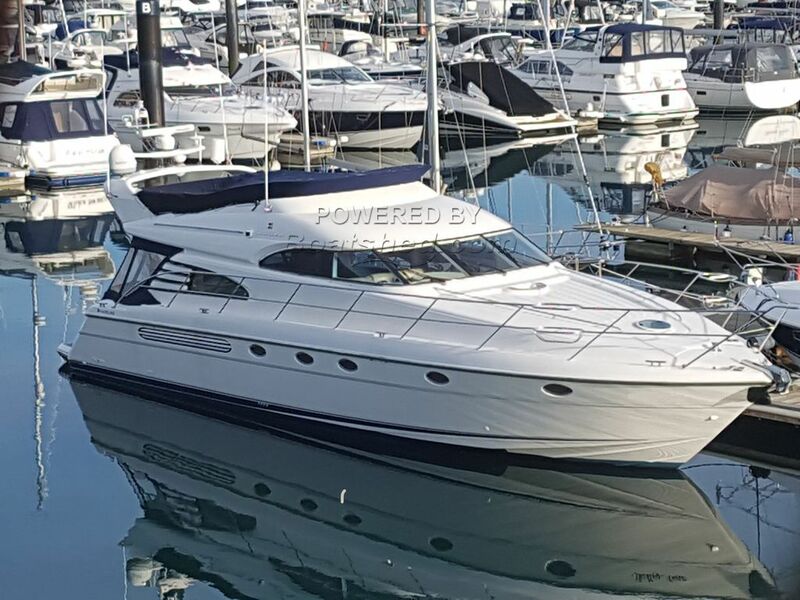 This Fairline Squadron 55 has been personally photographed and viewed by Phil Key of Boatshed Torquay. Click here for contact details.